Since so many of your are Mooney fans now, I figured I'd turn you on to some research I did nearly 10 years ago on Mooney's five little-known, sublime sides he recorded with the Sauter-Finegan Orchestra in 1952 and '53. But first, let's travel back to the early 1950s, when big-band arrangers Eddie Sauter and Bill Finegan formed the Sauter-Finegan Orchestra. Their aim was to have superior studio musicians play near-symphonic jazz scores using a seemingly endless combination of instruments. While the results sounded somewhat pop and, at times, unashamedly corny, the instrumental sophistication was not lost on a younger generation of arrangers, including Gil Evans, Nelson Riddle, Johnny Richards and Billy May. 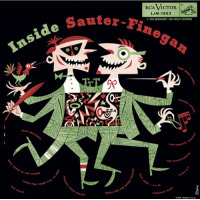 Originally conceived strictly as an instrumental aggregation, Sauter and Finegan agreed in the fall of 1952 to add vocalists. The move most likely came after pressure from their label, RCA, which wanted to give the somewhat wooden format a more human touch and popular appeal. Remember, this was the pre-rock era of earnest vocal groups such as the Ames Brothers, the McGuire Sisters, the Four Aces and the Four Lads who appealed largely to the rapidly expanding white suburban market. When Joe Mooney arrived to record with the Sauter-Finegan Orchestra in late 1952, he was there to provide vocals that wouldn't overshadow the band's six-lane orchestrations. Backing Mooney were two vocal groups: the Ray Charles Singers: Gene Lowell, Artie Malvin and Steve Steck; and the Doodlers: Sally Sweetland and Lillian Clark. The tight choral parts were written by veteran vocal arranger Ray Charles (a different Ray Charles). The first track Mooney recorded on November 3, 1952 was Nina Never Knew, a song written by Louis Alter and Milton Drake. The gorgeous melody came with creepy lyrics about the seduction of an innocent girl. The arrangement featured the wandering trombone of Bill Harris Also recorded that day was Love Is a Simple Thing, a song with a bouncy melody that had had its debut months earlier in New Faces of 1952, a Broadway revue. Soon after Nina Never Knew was released, the song became a jukebox hit, reaching #13 on the Billboard charts by December. The song would be the orchestra's second biggest seller after Midnight Sleighride, which had peaked at #12 that August. Mooney returned to the studio on November 18 to record Hit the Road to Dreamland, a mid-tempo tune that leaned heavily on novelty instrumentation. After touring with the orchestra for several months, Mooney and the band went back into the studio on April 6, 1953. The first tune recorded that day was Time to Dream, a Mooney duet with female vocalist Florence Fogelson. The next track recorded, Pale Moon, featured Fogelson alone. Then a third track was recorded that day—It's Mutual—a lovely tune Mooney co-wrote. This third track was something of an anomaly. For one, recording sessions typically captured an even number of tracks to complete sides of singles. For another, there was no choir arranged behind Mooney. Which leads me to believe that It's Mutual was a demo to show RCA executives what Mooney could do as a lead singer on his own. I spoke to Stanley Cooper in 2009, one of my favorite 1950s music industry sources. A retired Brill Building executive, Stanley worked for Redd Evans Music and later Barton Music pitching songs the music publisher owned to singers he believed could make them hits. When I called Stanley to ask him about Mooney and the Sauter-Finegan sessions, I was shocked. Stan replied in his Runyonesque New York accent: Did I know Mooney? I was the one who brought Nina Never Knew to RCA's attention in 1952 and requested that Mooney sing it." Back in '52, I was a fan of Joe Mooney's. I knew his work well. He had a great sound. Soft, but smart. When Redd Evans of Redd Evans Music picked up the rights to Nina Never Knew, he asked me to find a singer who could make it a hit. The first person I thought of was Nat [King Cole]. Nat was the nicest guy in the world. But when I asked him to record the song, he initially turned it down. Nat said he didn't like the name Nina. I have no idea why. Maybe he once had a girlfriend named Nina or something. I don't know. So I shopped Nina Never Knew around to different A&R men. When I reached Dave Kapp, the head of A&R at RCA at the time, he loved the song right away. Most music publishers who went to Dave brought along sheet music and demos by the pound. I never did that. When I went to see him, I brought only two songs, and usually just one. Dave knew that if I had a song I liked, he could figure out fast whether or not he liked it and which of his artists should record it. So he liked me. Dave said the best he could do was have the newly signed Sauter-Finegan Orchestra record it. I said fine, but the song had to have a vocalist. Dave asked me who I thought would be ideal. I said. 'Joe Mooney.' I chose Joe because he had a voice that was closest to the singer I originally wanted—Nat King Cole. The song needed that savvy, jazzy, relaxed sound. Dave liked the idea and sent for Joe. When Mooney came into the RCA studio that day, he and I spoke briefly. I told him how much I liked his voice and why I wanted him for the date. He thanked me. He was a very pleasant guy. Then I went into the [engineer's] booth with the A&R men and my boss, Redd Evans, to listen to the recording. When the band started and Mooney began to sing, I couldn't believe my ears. As soon as I heard the first four bars I knew right away that I was right about matching Mooney with Sauter-Finegan and that the song had a real shot. It was like being in a trance listening to that sound. I recall Mooney went off mike a few times so they had to start again and bring him back in. But that's all I noticed with my eyes. My attention was my ears. Listening to that sound for the first time was amazing. I don't know why Mooney never recorded more with Sauter-Finegan or on his own with RCA. It was a natural fit. I do know that RCA offered him a multirecord deal with the label and that there was some disagreement over money. Dave Kapp was the kind of guy who made an offer and if you didn't take it, he never came back to you with it. A lot of people didn't like him because he was a cold fish. But I liked him because he was a good music man. He truly liked music people. I guess that's what happened with Joe. It's a shame really. They sounded perfect together. The band was easy-going but square. Joe was easy-going and hip. He gave them a little more edge. I can only imagine how great the music would have been if they had recorded more sides together. Shame on Dave Kapp for not seeing the value in Joe Mooney's vocal with the Sauter-Finegan Orchestra. Hard to imagine Mooney wanted that much more than Kapp was willing to shell out. I could dig another 20 songs like these. Eddie Sauter died in 1981; Bill Finegan died in 2008; Joe Mooney died in 1975; and Stanley Cooper died in 2016.